Patriots head coach Bill Belichick listens to a question during the Super Bowl Opening Night at Xcel Energy Center in St. Paul, MN on January 29 2018. BLOOMINGTON, Minn. – With his team just a few days away from playing the Eagles in Super Bowl LII, New England coach Bill Belichick had little interest in talking about the Patriots' legacy as perhaps the greatest dynasty in NFL history. 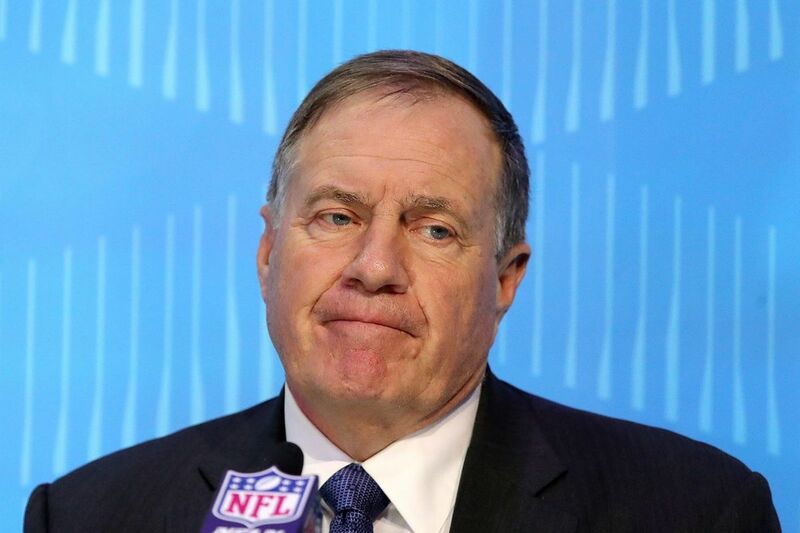 Belichick, arguably the greatest coach in league history, would dismissively answer such questions by pointing out that the Patriots' success – five Super Bowl titles and eight championship-game appearances in 16 years — has zero impact in preparing his team for the immediate task at hand Sunday inside Minneapolis' shiny new U.S. Back Stadium. Talk of dynasties was left to others. "You have to look at longevity and put them first," said NBC studio analyst Tony Dungy, who played on one of the Pittsburgh Steelers' record six Super Bowl title teams and went 5-5 against Belichick as a head coach with Tampa Bay and Indianapolis. "The big thing about Bill, and I would say the same about Tom Brady, is that it's just human nature when you've won two, three, four times to think, 'Hey, I've done this and life is pretty good.' But they still come to work every day after winning five Super Bowls saying, 'I want to be the best coach in America and I want to be the best quarterback in America, even though I've already been that for the last 15 years. That's unique." The Eagles, of course, have a chance to slightly affect the long-term view of the Patriots' dynasty. Beat Belichick and Brady and they will prevent New England from joining the Steelers as the only other team with six Super Bowl titles. Rodney Harrison, who is Dungy's partner in the NBC Sunday Night Football studio, believes the Eagles have a real chance to do just that. "I do believe Philadelphia can score, and score a lot of points," said Harrison, a safety who had a huge impact on the Patriots' 24-21 Super Bowl win over the Eagles 13 years ago in Jacksonville. "I look at this [Patriots] defense and there is nothing that scares me. You don't see team speed and you don't see the ability to create a lot of turnovers. They do not have big names or great players, but they do have guys who work well together." >>>SUPER SUNDAY: Our Super Bowl coverage from Minneapolis and Philadelphia will begin at 7 a.m. Sunday. That is an interesting take from a man who still refers to the Patriots as "we" and his point about takeaways was really a valid one. The Patriots were 25th in the NFL in takeaways this season and 30th in forced fumbles. They did not force a turnover in either of their AFC playoff wins against Tennessee and Jacksonville and they have just two takeaways in their last seven games. By contrast, the Eagles defense ranked fourth in the NFL with 31 takeaways and has 18 in its last nine games, including three in their NFC championship game rout of Minnesota. It is no secret that the best way to beat the Patriots or any team for that matter is by winning the turnover battle. The Patriots' are 27-9 in the postseason with Belichick and Brady, and in the 27 wins they are plus-33 in turnovers with 59 takeaways and 26 turnovers. In the nine losses, they are minus-12, with six takeaways and 18 turnovers. The Patriots, however, have lost the turnover battle by one in each of their last two Super Bowl victories. Should the Eagles beat New England, it will be interesting to see how that will affect the Patriots. An ESPN.com story last month detailed a growing rift between the legendary coach and the extraordinary quarterback. With the Patriots trading Jimmy Garoppolo to San Francisco in the middle of the season, Brady is not going anywhere any time soon. Why should he? Sure he turns 41 in August and that's unchartered territory for NFL quarterbacks, but he's a fitness and health freak who just led the league in passing yards and attempts. He wants to play into at least his mid-40s and Patriots owner Robert Kraft is on board with the idea. Harrison believes the strife between the coach and quarterback is greatly exaggerated. "They should have written a story about me and my wife because we have strife sometimes," he said. "Sometimes she won't talk to me for a couple of days. It happens when you're in a long-term relationship. The thing I still see with those guys is they respect one another. And Belichick knows how to push Tom Brady's buttons more so than anybody. It's a healthy, respectful relationship." Like Brady, Belichick does not appear to be going anywhere any time soon. He's 65, which makes him the second-oldest coach in the league behind Seattle's Pete Carroll, but he, too, is fit and seems to be enjoying himself now more than ever with his two sons – Steven and Brian – serving as assistants on the New England staff. "Maybe he is staying there to firmly entrench his kids in that organization," Harrison theorized. "Maybe once his sons are firmly entrenched he will walk away in a few years." Belichick's older son, Stephen, who played lacrosse and was a long-snapper at Rutgers, has been the New England safeties coach the last two years. "It has been great" working with him, Belichick said. "Steve has done a great job. He has helped give me a good perspective on things that he sees as an assistant coach who is a lot closer in age to the players than I am. He has a perspective of the players' needs and a feel for things that I need to address and I might miss because I don't see things from the same point of view." The Patriots will definitely suffer two major losses after the Super Bowl. Matt Patricia, who has been the defensive coordinator for the last six years, is leaving to become the Detroit Lions' head coach, and Josh McDaniels, the offensive coordinator the last six years, is leaving to become the head coach in Indianapolis. Replacing those two will not be easy. But it will not be nearly as difficult as the day when the Patriots have to replace arguably the greatest quarterback and the greatest coach of the greatest dynasty in NFL history.